Transylvania Trail Riding Vacations from the rural village of Sinca Noua through the foothills of the Carpathian mountains to medieval villages and UNESCO sites. Explore Saxon villages in Transylvania and meet the locals. Horseback riding vacations are a popular way to see Romania, a Central European country where most people live in rural areas and make a living from the land. There is much history and natural beauty in Romania, which is best explored from the saddle. About the size of Oregon, Romania's diverse terrain inlcudes stunning mountains, fertile orchards and vineyards, beautiful rolling hills, fertile plains and numerous rivers and lakes. In fact, much of the country is covered by the Carpathian Mountains, also known as the Transylvanian Alps. These Romania riding vacations are in the foothills of the Carpathian Mountains in Transylvania in the center of the country. There are no gates to open and you are not restricted to bridle paths or paved roads - instead there are seemingly endless meadows, forest tracks, mountain rides, historic castles, medieval towns and beautiful open land to explore. The riding is a mix of paces to suit the terrain and is fast in places. Enjoy nice canters and visit a fortified church in Viscri on the Transylvania Trail Riding Vacation. Spend nights in guesthouses or with local famililes to truly get an authentic cultural experience while traveling in Romania. Romania has a temperate climate, similar to the northeastern states in teh United States, with four distinct seasons. Spring has warm days with cool mornings and evenings. The summer months can be hot. Autumn is usually dry and cool. A riding helmet is required on these vacations. The much-loved horses include part-Lipizzaner, Arab and Shagya-Arab, Kisberi, Gidran and Hungarian Sport Horses. The horses are fit and forward going, with stamina for the mountains. The horses are ridden in English tack. In additon to the horse riding and the variety of cultural experiences, local food and history you'll discover, there is much for non-riders to do and other things for riders to enjoy in their free time. Please see each itinerary to know the day to day riding schedule. Many people enjoy hiking the hills and meadows and mountaineering or climbing the nearby Piatra Craiului (Royal Rock) with its 2,250 m or the Bucegi (over 2,500 m) Mountain. Wildlife viewing and bear watching are also popular in the Sinca Noua area. For those who want get into higher elevations, there are day trips into the alpine regions of the Carpathians on the Transfagarasroad to Balea lake. Transylvania has a long and rich history and people in Romania are generally open and friendly. Gain insight into how people live in the small, charming villages at the foot of the Carpathian Mountains. Modern guesthouse (ski chalet style) accommodations with nine bedrooms, each with its own private shower room. Downstairs, there is a dining room, a large living room and a bar. The guesthouse has a modern wood central heater. There is also a veranda, where you can sit outside and relax. Please note that the chalet also accepts bed and breakfast guests, (including young children) who join the riding guests at meal times. There is wireless internet. On the Transylvania Trail Riding Vacations, the accommodations are mostly shared rooms in guesthouses or staying with local people. Since you are in rural Romania the standard and comfort of accommodation is not as high as perhaps in other parts of Europe. On some nights of the accommodation is shared triple rooms or perhaps even ‘dormitory style’. On other nights, when staying with local people, you may sleep in a dining room or living room, which all adds to the adventure! Showers are available on all nights of the ride, although bathroom facilities are usually shared. There may be one or two nights where the whole group need to share a bathroom. In Viscri you stay in various guesthouses in the village, some of which may have long drop loos outside. Often the group will be split up amongst different houses. Some overnight stays are quite basic but do offer an accurate insight into life in this region. The tranquillity and slow pace of life in these villages will hopefully make up for any short-term discomfort. Eat locally sourced food. People in Sinca Noua farm organically wtihout the use of pesticides or artificial fertilizers, and livestock is still kept the old way-- outside free roaming in pastures. Your guides and the owners for these riding vacations also have their own vegetable garden where they grow onions, lettuce, zucchini and more. You'll be surprised at how much flavor there is from fresh, local produce. Other food such as milk, potatoes, lamb, and veal is bought from the farmers in the neighbourhood. Intermediate to advanced riders who want to experience Romania's mountains, villages and historic sites from the saddle. This is a great country for horse riding. Non-riding companions are welcome as well. On this Romania riding vacation, you stay at the same guesthouse for the duration of the trip, except for a possible night out on the trails (weather permitting). You are based in the charming small village of Sinca Noua, which has strong rural traditions and culture, at a large wooden chalet-style guesthouse. Ride through forests, apline meadows, and gorges on fit, forward going horses. Also visit the village of Viscri with its famous fortified church from the times of the invasion of the Turks and the medieval city of Sighisoara in the historic region of Transylvania. This vacation is for intermediate to experienced riders and is appropriate for non-riding friends as well, as there are plenty of activities for them. * Prices shown are subject to daily exchange rate fluctuations. Payment by credit cards, fees apply. Riding; full board accommodation; drinks; return transfers from Bucharest (at set times); visit to Viscri and Sighisoara. International flights to Bucharest Otopeni. Optional donation to local conservation fund €40; tips. Tips are commonly paid in Romania, 10-20 € for all the staff is a reasonable tip for a week. Travelers can rent a sleeping bag from the riding center for the 2-day overnight ride, if you don’t want to bring your own sleeping bag. Costs for rental is $17 USD* (15 Euros). Fly to Bucharest airport (please be sure to arrive by 16:15), where you will be picked up and transferred through the spectacular Carpathian mountains to our guesthouse in Sinca Noua (ca. 3 hours). Receive a welcome drink upon arrival, a great dinner and spend the evening with the staff to prepare the week. After breakfast you will be shown around the farm and introduced to the horses. Soon we take off for the first ride along the meadows and through the forests at the foot of the mountains. The hills offer a fantastic view over the area and the meadows invite for some first trots and canters. You will be stunned by the variety of wild flowers and we often come across tracks of bears or wild boar. There are lots of possibilities for canters over the meadows. We do our lunch breaks on beautiful meadows with spectacular views and return in the afternoon back to Equus. After dinner, you have the choice to watch video presentations about the research and conservation projects, which the owners of Equus have carried in recent years. You might also opt to spend the evening under the willow pavilion by the open fire place or have a drink at the cosy bar. One evening, you will have the possibility to visit a bear hide in the forest not far from Equus Silvania, where the chance to see wild brown bears is very high. Today we give the horses a rest and experience the true history of Transylvania. We leave Sinca Noua and drive north for about two hours through sleepy villages, until we reach the medieval town of Sighisoara, one of the cultural centres of the Transylvanian Saxons. Thereafter, we continue to the village of Viscri with its famous fortified church (UNESCO World Heritage Site) from the times of the invasion of Turks. A gravel road gets us the last 10 kilometers to Viscri, a settlement of the German minority, founded 900 years ago. In 1990, most of the villagers left for Germany, but a small number of people stayed to continue their traditional life. Prince Charles, who visited the village many times, is a great admirer of the village. We will be served a traditional Saxon meal with food from their own gardens and home-made wine and plum brandy: Atfter a relaxing lunch, we visit the fortified church, stroll through the village and return back to Sinca Noua for the evening. Your local Romanian guide is passionate about the history of Transylvania and once you have spent the day there with him, you will be as well. A 50 km roundtrip leads us through the endless forests of Transylvania, home of the large carnivores. We pass through forests and cross beautiful mountain meadows where you will have the possibility for some long canters. In the afternoon you will arrive to an area where people’s life has changed little since the Middle Ages. Their little mountain farms are still being worked with oxen or horses, while people even still lack facilities such as running water or electricity. Camp is set for us atop a ridge on a farm with fantastic views all around. We will enjoy a rustic dinner cooked on the campfire and have a long evening around the fire to tell stories enjoying some beverages. If you don’t fancy camping out in tents, we are happy to pick you up after dinner (20 min walk is necessary) and drive you to the guesthouse for the night and back again the next morning. The next morning we pack our stuff and ride along forest trails and roads through the wild forests of Transylvania. We enjoy the spectacular view over the Carpathian Mountains meanwhile tracks of wolves and bears are commonly found along the trails. In the afternoon, we arrive back at the guesthouse. On our last ride for the week, we ride for about 3 hours in a loop around Sinca Noua through wild forests, beautiful meadows, while enjoying canters and great scenery. We are back for a late lunch, to continue in the afternoon to the nearby Bran castle, commonly known as Dracula’s castle. However, you will learn that the history is much more exciting than the legend. After breakfast we pack our luggage and are brought back to Bucharest airport. Please do not book flights departing before 14:00. ** This itinerary is a sample itinerary. Itineraries are subject to changes due to the weather, the trip guide's discretion and other factors. Seven night trail riding vacation beginning in the rural village of Sinca Noua. Ride 93-miles (150km) on horseback through the foothills of the Carpathian mountains to medieval villages and back to Sinca Noua. Stay in guesthoueses and village homes and interact wtih the locals. Discover a land made for exploring on horseback! This riding vacation is for advanced riders. Included: Riding; full board accommodation; reasonable supply of drinks; transfers from Bucharest (at set times- 3 hour by bus from Bucharest to Sinca Noua). Not included: Optional donation to local conservation fund €40; tips. * Prices shown are subject to daily exchange rate fluctuations. Single rooms are possible on some nights only. It is not possible to guarantee single accommodation throughout the whole of the ride. Where available, single rooms are an extra 15€ per night payable locally. Riding; full board accommodation; drinks; transfers from Bucharest (at set times). International flights to Bucharest Otopeni. Optional donation to local conservation fund €40; tips. In guesthouses or with local people on the way. Attention: We are in rural Romania and the standard and comfort is not always very high. Some overnight stays are rather basic, others very cosy and nice. The tranquillity and slow pace of life in these villages makes up for the possible discomfort. 4-7 hours per day (incl. lunch break). 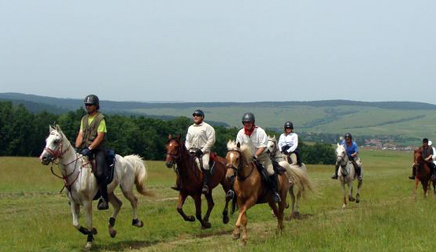 This Romania riding holiday is not suitable for beginners. Travelers should be competent in all speeds and able to fully control a horse in canter. There is cantering and galloping everyday. A hard hat is obligatory for all riders! Arrival in Bucharest (please make sure you arrive until ca. 16:15 the latest), transfer by minibus from Bucharest to Sinca Noua, overnight at the guesthouse of Equus Silvania, dinner and evening introduction into the ride. Single rooms available upon request tonight. After being introduced to the horses, we will leave Şinca Nouă (pronounced Shinca Noah), ride along the valleys and over the foothills of the Carpathian Mountains towards the plains of the Olt River valley. We pass the ‘Daffodils Meadow’ Nature Reserve and can experience already several of the long canters before we arrive after about 7 hours at our destination in Mândra, where we will stay with a local family. 31 km distance. Only double and triple rooms available tonight. We will cross the Olt River at Halmeag and continue up the Felmer Valley, where we will enter into the hills of Transylvania. We ride along a beautiful ridge with marvellous views to the Fagaras Mountains and reach our goal of the day in Cobor, an old Hungarian village in the middle of the Saxon area. Today, we ride a total of about 7 hours and will start to experience the beauty of this ancient land. Full-day ride (6 h) around Cobor with stunning views, fast canters, and rich birdlife: We are likely to see bee-eaters, hoopoes, great grey shrikes, stone chats, or lesser spotted eagles. In the late afternoon we are back in Cobor and can chill out in the old stables or in the cellar bar. Ca. 31 km distance. Single rooms available upon request. Full-day ride ca. 7 hours over the hills to Viscri, our destination for the next night. Viscri is probably the famous most Saxon village in Transylvania with a stunning fortified church, and the UK based Mihai Eminescu Trust (under the patronage of Prince Charles) has restored the village in its original setting. We stay in the old farmhouses, which are transformed into little guesthouses, and enjoy the traditional Saxon cuisine. In the evening there is time to explore the village. 39 km distance. Single rooms available upon request. In the morning we explore the fortified church in Viscri, visit the local blacksmith (who still works by hand with old bellows and a charcoal fire), and have a lunch before we go. In the afternoon, we ride over the hills to a log- house on a big meadow in the forest near the village of Jibert. Stunning scenery and great canters all along the way. Today is a rather fast but shorter ride, ca. 3.5 hours. We get a great dinner and will enjoy the relaxing atmosphere of the Transylvanian countryside. 24 km distance. Single rooms available upon request tonight. Today is our last day, but there are again plenty of canters over the hills and through the forests. Eventually we arrive in the Olt Valley, have a beautiful ride along the ridge through ancient oak pastures and descend from there through the forests towards Halmeag, where our ride ends. Here we enjoy a barbecue and a bus takes us back to Equus Silvania in Sinca Noua and also our horses get a transport back home. Surprise dinner in the evening. 34 km distance. Single rooms available upon request tonight. After a last breakfast, a minibus takes you back to Bucharest for your flights. At the foot of the Carpathians is the village of Sinca Noua, “New Shinca”, a small and picturesque village of some 2,000 inhabitants. In winter, the mountains and forests are snow-packed and it is often easier to find tracks of wolves, lynx or red deer than of humans. * Prices shown are subject to daily exchange rate fluctuations. 84 €/week single room supplement payable locally. Included: Riding; full board accommodation; drinks; return transfers from Bucharest (at set times). Not Included: International Flights. Tips are commonly paid in Romania, 10-20 € for all the staff is a reasonable tip for a week. Optional 40 € donation to the Carpathia conservation project. Fly to Bucharest airport, (please arrive by 16:15) where you will be picked up and transferred through the spectacular Carpathian mountains to our guesthouse in Sinca Noua (ca. 3 hours). Receive a welcome drink upon arrival, a great dinner and spend the evening with the staff of Equus Silvania to prepare the week. In the evenings there is time to relax with a home-made liqueur or brandy in front of the open fire, have a drink at our bar, or watch video presentations about the research and conservation projects of your hosts. Today is a break from riding for the horses and yourselves so you can experience the history of Transylvania. The group decides as a whole, whether to visit Bran Castle (the so-called Dracula Castle, but you will experience the true history of the place) and the old town of Brasov, or Sibiu (European Cultural Capital in 2007) - or some of the smaller medieval villages of Transylvania. Again, head out for a morning and an afternoon ride through the hills, forests, and meadows of the surroundings of Sinca Noua. It is very likely we come across tracks of wolves, lynx or red deer and with some luck, you may also see some of the forest inhabitants of the Carpathians. Evenings are spent in the cosy Equus Silvania guesthouse. If you wish, we may have the possibility of organising a trip with a horse-drawn sledge. After breakfast you will be brought back to Bucharest Airport. Please do not book flights departing before 14:00. A 'must-do' ride. Let the rolling hills of Transylvania invite you for endless canters, before winding your way through shady forests of oak and hornbeam. Stop on the crest of a hill to marvel at the wide open spaces of this magical land, virtually untouched by the modern world. Spirited horses, fast riding and the delights of rural Romania are sure to bewitch you. Excellent horses, fantastic riding. Brilliant - can't wait to go back again! A ride for those who like fast going on really keen horses. Not for timid or inexperienced riders, and I would recommend getting really fit beforehand. The countryside is breathtakingly beautiful, and it is a vast unspoilt wilderness." One of the best rides ever, from all points of view!! Defenitely coming back...as soon as I can. Lots of very sincere thanks to everybody, horses included, of course! 4 to 6 hours per day in the saddle.